I am pretty sure I have written this sentence before on here but it is so true I am going to write it again. All the best projects and activities in our house are kid invented. I read about stuff online or in books and we do it and the girls usually like it but the favorite things are almost always invented by them. A while ago the Bee found this tin bucket with a Styrofoam circle in it. The bucket was leftover from a display I had had at their school. She asked if she could have it and I said yes. A few minutes later I walked in to find that she had gotten some pipe cleaners and was sticking them into the Styrofoam. 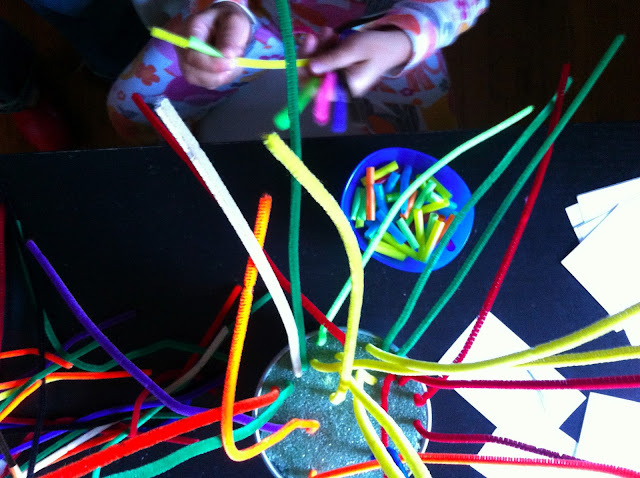 The pipe cleaners created a cool sculpture, popping out and bending over. In the same bag I had a big jar of cut up straws, so I put some of those in a bowl for her and she added them to her sculpture. 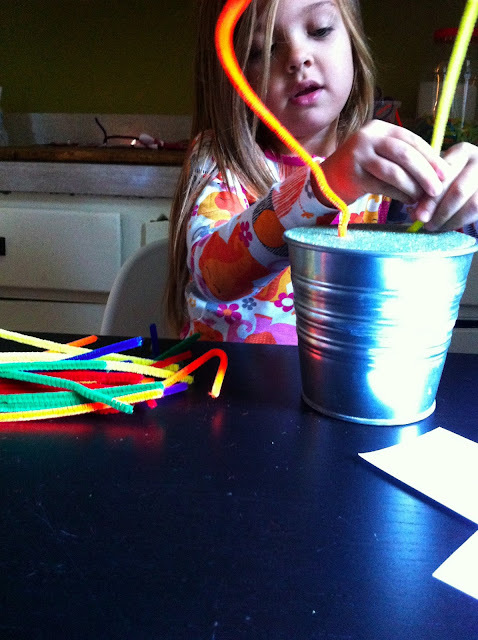 She loved threading the straws on, adding more and more pipe cleaners and then bending, twisting and untwisting the pipe cleaners. She originally made the sculpture back in the Fall but since then the sculpture has found a nice home in our art area. The girls still frequently pull it down to add to or change around. When it is not in use it looks so cool just sitting there that it has definitely become one of my favorite works of art. I love the constant change of it and the fact that it is so frequently in use. Thumbs up, I have never seen the knowledge about which you shown in the post absolutely very attractive post for everyone which is related to the job, recently my friend Neni told me about this but I did not consider it seriously. That is the great post I like it very much its all about the real knowledge. This is the real knowledge, I have never seen the information on this topic before well said.